Friendship Park, located at the most southwesterly point of the U.S.-Mexico border, exists thanks to a small group of men and women who have come together over time to call themselves Friends of Friendship Park. From about 2006 to 2011 their civil disobedience forced Border Patrol to negotiate access to this binational space, which the federal government would have preferred to keep closed. Friendship Park is located on federal property. Only twenty-five visitors can go inside at a time and then, only on the weekends from 10am to 2pm. Once inside the park, Boundary Monument #258 stands behind a mesh fence. 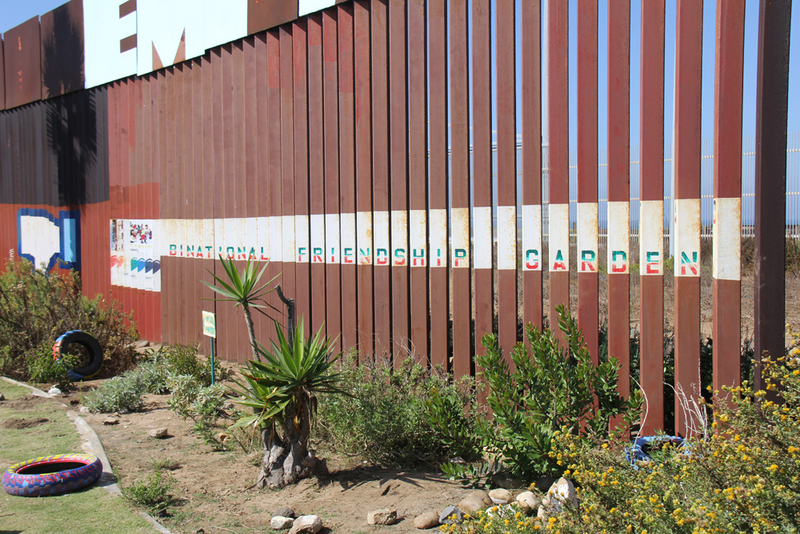 A binational garden also exists on the U.S. and Mexican side. It has three circles: two that are about ten feet in diameter and one that is about thirty feet in diameter. 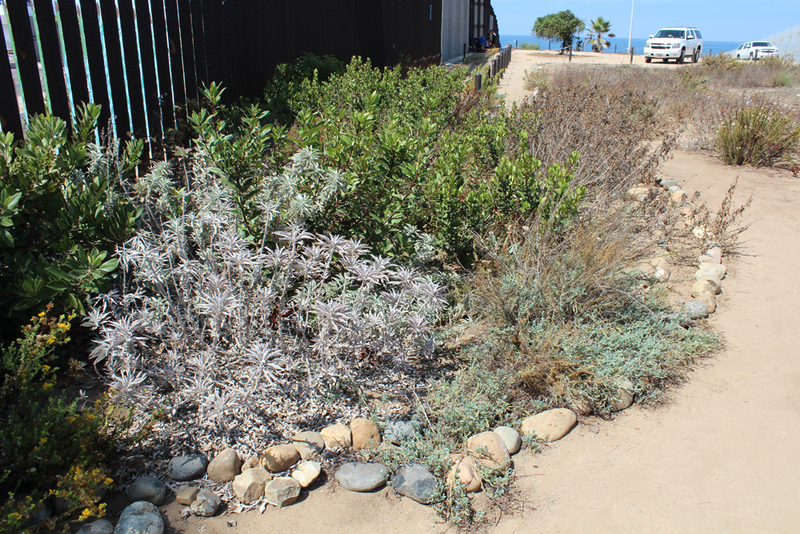 Dan Watman is the individual who created this binational garden against all odds. Who knew that there are parts of the United States where participation in gardening, yoga and poetry readings could lead to clashes with federal agents? Dan Watman grew up in Modesto, California. After high school, he attended Arizona State University and majored in aeronautical technology. At first, he planned to become an airline pilot, but somewhere along his college journey, Dan realized he had a passion for speaking Spanish. Instead of becoming a pilot, Dan decided to live in Ensenada for a year and teach Spanish to foreigners at a language school. Then, while pursuing a Master’s degree, he lived in Tijuana. Ever since, Dan has lived with “one foot on both sides”–moving easily back and forth between San Diego and Tijuana. He asked the administration at Mesa College for official permission to take his class on a field trip to Tijuana. The administration, however, said the permission process would take over a year. Dan wanted to find another way. Border Patrol was ready. They drew a line in the sand and said the activists couldn’t go past…The Minute Men then blew whistles, yelled and pushed people. He had explored the U.S.-Mexico border many times and found a place at the Pacific Ocean called Friendship Park. While living in Tijuana, Dan also worked as a volunteer lifeguard in Las Playas and had several lifeguard friends. Instead of taking his students into Mexico, Dan took his students to Friendship Park and told his lifeguard friends to be there at the same time. In 2004 people could still come up to the fence and speak to one another, so it was here that Dan provided his students with a language exchange. After bringing his students to Friendship Park, Dan started to come up with other ideas that could get people to make friends through the fence. To do this, he created an organization called Border Encuentro. From 2006 to 2007, Dan helped set up yoga classes, poetry readings, and gardening events at the fence. Facebook hadn’t yet taken off, so everything was done through email and word-of-mouth. They were small gatherings meant to promote common interests at the border. He found that although people made friends during the actual event, it was during the organizational stage that people from both sides of the border became close. Then, at the end of 2006, everything changed. Border Encuentro was threatened by impending wall construction. He started uploading the construction on You Tube. In the middle of 2007 he noticed a huge ramp up in the pace of construction, yet Dan’s filming wasn’t getting enough attention. He knew Protestant Minister John Fanestil through their common border interests. When Dan explained the construction, the two men formed a group to stop border wall construction. The group realized they couldn’t stop border construction, but they might be able to save the park. That’s when the Friends of Friendship Park came together. According to Dan, John Fanestil led the charge. He committed to doing communion through the fence until Border Patrol physically stopped him. The Friends got behind the idea. Border Patrol was ready. They drew a line in the sand and said the activists couldn’t go past. The Minute Men then blew whistles, yelled and pushed people. A sheriff went up to them and soon thereafter, they left. John Fanestil, determined to have communion at the wall, started walking toward the border. About forty people lined up next to him and started to pass the line in the sand. They also detained Dan, taking him with his hands behind his back and walking him up a hill. Dan then sat in the back of the Border Patrol unit for about an hour. Meanwhile, Border Patrol brought in more reinforcements and, not wanting any violence, the number of protesters began to dwindle. That was the climax of trying to stop the wall. Their efforts didn’t stop the federal government. Instead, Friendship Park closed in 2009 and wasn’t opened again until 2011. “The wall came in, obviously, but we had formed this very strong group that was very dedicated.” The group wondered what they could do next. That’s when Harvard-educated architect, James Brown, came on board. The group decided they wanted access to three specific spots: the monument, the garden and the beach. Because the government had cut everything off by April 2009 when construction was finished, there was absolutely no access whatsoever to those areas. But James Brown started having success talking to Border Patrol. He convinced them to create a rolling gate. The gate would roll open up to sixty feet, but it could be controlled by Border Patrol at all times. The gate could open during events, but could also be closed quickly. The government paid for this big rolling gate in 2012. During that same year, Border Patrol created a Community Liaison Department with a specific position created for Friendship Park. An Border Patrol agent would now keep the door open during specific hours. The history of the binational garden intertwined with these events. When Dan piloted a Border Encuentro event in 2007, he brought middle schoolers from Tijuana together with Kearny Mesa high schoolers to plant a binational garden. At the time, no secondary wall existed, so the area was wide open. Dan negotiated with Border Patrol for a tiny little plot on the U.S. side. The plot on the Mexican side was much bigger. Watering was a huge challenge. At first, Dan had to walk at least a half-block and fill up two 5 gallon buckets. During the first year, the plants needed a lot of water. “I was so passionate and dedicated to it, I didn’t care. I was there sometimes until two in the morning just bringing buckets back and forth.” Later, Dan put in a little spigot on the Mexican side where he could hook up a hose. The main obstacle, however, came when the wall construction started. Border Patrol cordoned off the area and prohibited access. Dan needed to water the plants, so he emailed and called the agents, but never received a response. Dan would then go out there and ask the agent for permission to enter. Usually, the agent allowed him to be there for about ten to fifteen minutes to take care of the garden. He would then wade through the ocean to the Mexican side to take care of both sides. At a certain point, however, Dan got a call from Imperial Beach Border Patrol station and was told that he needed to remove his garden. The agent explained that the plants could get in the way, especially if agents need to chase someone. Dan tried to negotiate and they said he could talk to their supervisor. While waiting to get the call, agents removed the garden. In 2009, one of the Border Patrol agent’s had a change of heart. Although he explained that he couldn’t allow public access to the garden, he volunteered to replant the garden himself. Dan wasn’t happy, but accepted the offer. At the end of 2009, the agent went out with his son and replanted the garden. It was half the size of what it was before. Dan boldly asked permission to expand the garden. The IB agent allowed it. Today, the garden still exists and there are over 100 plants on both sides. From wanting his students to have a space for binational exchange to civil disobedience, Dan didn’t originally intend to become an activist. He says he didn’t realize at first that U.S. policy toward Mexico leaned toward separation rather than friendship. Dan explains that friendship, and the trust that comes with friendship, is actually a better protection than any isolation. Barbara Zaragoza is a freelance writer who covers the South Bay, San Diego. She recently published a photographic history of San Ysidro and the Tijuana River Valley and also writes about arts, culture & activism at SouthBayCompass.com. Barbara is a multiple award winner of the Society of Professional Journalists, San Diego chapter, 2016 Journalism Awards. « Securing the U.S.-Mexico Border? What a saga; Dan Watman is a truly committed hero. His efforts in behalf of binational peace are duly recognized and commemorated in this beautiful article, Barbara.